Major League Baseball’s opening day is just around the corner. In some baseball-crazed households (mine) and baseball mad cities (St. Louis), it might as well be a citywide holiday. In preparation for it, and in the hopes of appeasing Annie Savoy’s baseball Gods, here are some famous (and some not so famous) TV characters and their favorite baseball teams. So much of this show revolved around baseball. 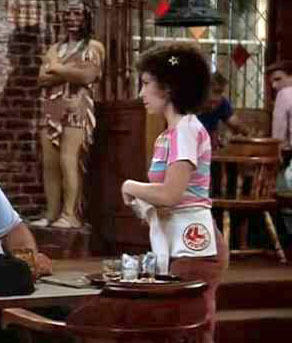 The show’s male lead and bar owner, Sam Malone (Ted Danson) was a former pitcher for the Sox. Coach Ernie Pantusso, one of Malone’s coaches and two-time league leader in HBP’s, was one of the bartenders. Real life Red Sox great Wade Boggs made a guest appearance on the show and got pantsed by the gang. And Carla Maria Victoria Angelina Teresa Apollonia Lozupone Tortelli LeBec (Rhea Perlman) once bludgeoned an obnoxious Yankee fan’s head by banging it into the bar. It was baseball fandom at its best.